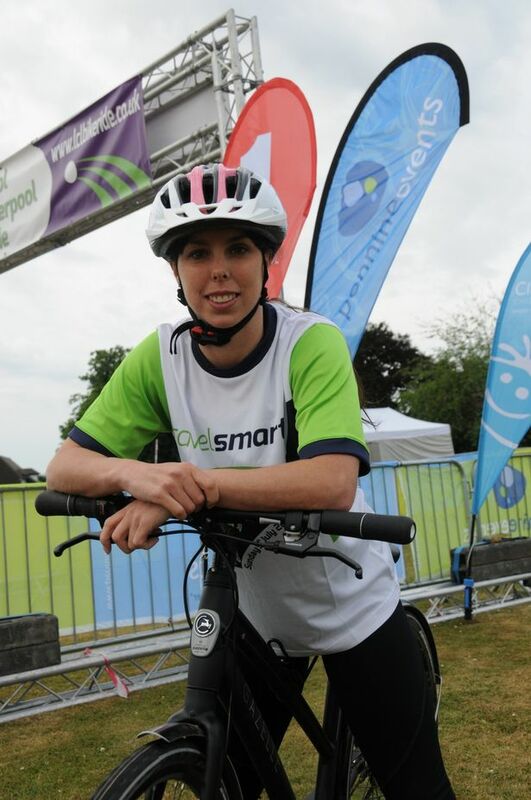 Bunbury sporting hero Beth Tweddle helped make this year’s Liverpool-Chester-Liverpool bike ride the most successful yet. More than 3000 cyclists took to the streets of Cheshire and Merseyside on Sunday for the annual iTravelSmart cycle ride, which raised thousands of pounds for Claire House Children’s Hospice. And there to offer their support on the day were Olympic bronze medallist Beth, and Paralympian road and track racing champion, Rik Waddon, who both took part in the different challenges which spanned from a five to 100 mile cycle through stunning parts of the Cheshire countryside, including Delamere Forest. Former Queen’s School pupil Beth said: “This is the first time I have taken part in the event – but it definitely won’t be the last. There was a fantastic atmosphere with everyone just there to have a great time and to encourage each other. “In January I had a routine operation on my ankles – everything went well but I had to rest them for quite a while afterwards. Cycling was one of the first sports I have been able to take up and I have a new found love for it. “Last year I dropped my boyfriend Andy off at the start line and wondered why I wasn’t taking part so this year I decided to join him and I am so glad I did – and to be taking part in a record-breaking year too,” she added. Participants in the event were offered the option of a number of challenges spanning from five miles up to 100 miles. Mandy Parkinson, Commercial Manager at organisers Pennine Events, added: “We are absolutely delighted with the success of this year’s event. It was great to have the support of Beth and Rik and to include new areas on the routes too. “Everyone appeared to have a great time and raise lots of money for charity at the same time. Registration is already open for the 2016 event which will take place on July 3 next year.